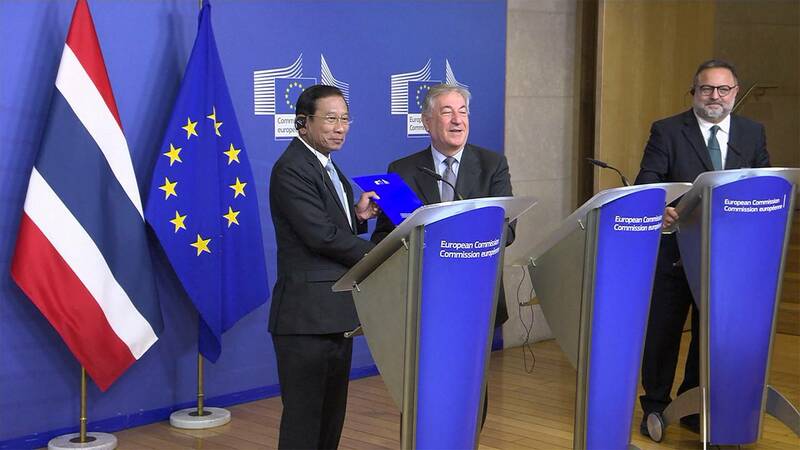 In this web bonus you can hear from Karmenu Vella, the EU's Commissioner for Environment, Maritime Affairs and Fisheries, on Thailand's re-instatement as a trusted exporter of seafood that has succesully tackled Illegal, unreported, and unregulated (IUU) fishing. The country was suspended, or 'yellow-carded' for three and a half years whilst it underwent an array of reforms to ensure it was not overfishing, as it had done for decades. “We have worked hand in hand with the Thai authorities to complete a comprehensive reform of the fisheries governance of the country and this included the fundamental overhaul of the legal framework. With this, we have seen improvements in traceability rules and in the monitoring control and surveillance tools and also in the way that the fleet is managed,” Vella said. Standing alongsde him at the news conference in Brussels was Thailand's Deputy Prime Minister who said his country was now committed to ending overfishing. “Today, Thailand has successfully elevated its commercial fisheries sector both in internal waters and in international waters to the international standards. We are ready to partner with the EU in promoting sustainable fisheries at both national and regional level. Thailand has a strong determination to eradicate IUU fishing,” Chatchai Sarikulya said.